Wouldn’t it be great if every bride could have her own seamstress and a team of designers to help her make every detail of her wedding just as she always imagined? 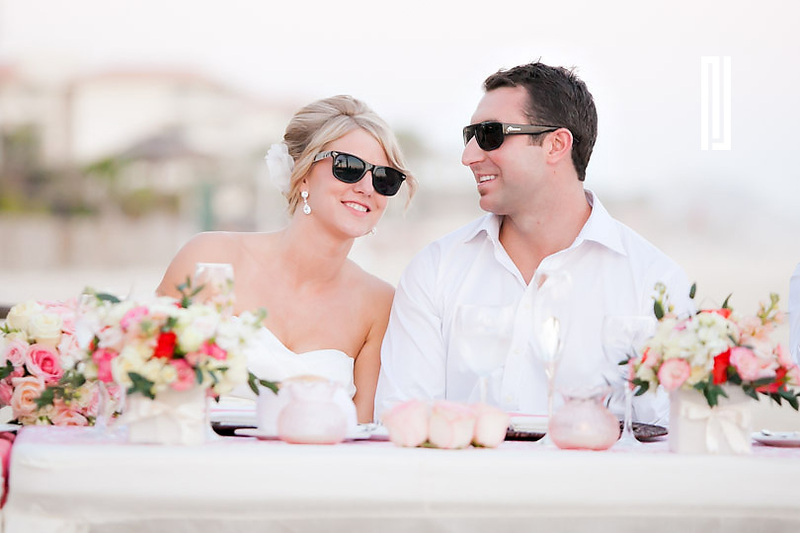 If your destination wedding happens to be here in Cabo San Lucas, then we want you to know you can have this fantasy come true! Canadian bride Cara came to our showroom while visiting Cabo for her site inspection. While we know not every bride can visit us on-site prior to her ceremony, we loved meeting Cara and having her see and touch the fabrics herself. We adore that moment when brides realize we do so much more than order pre-made linens and furniture—our design team actually creates pieces based on each bride’s vision. Cara’s dream included a shade of coral that seemed destined for a wedding in the sand. 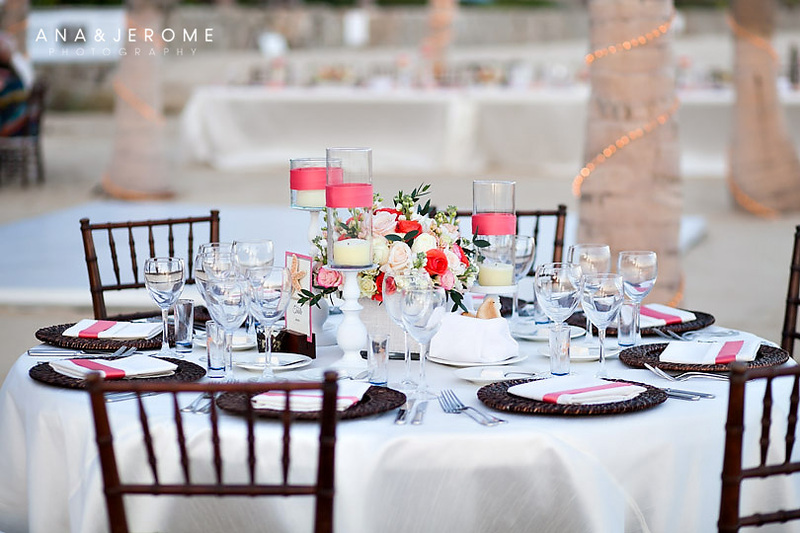 We kept this strong hue sophisticated by using it sparingly against crisp whites and textured wicker décor. We created the coral table runners just for Cara’s event and added wide coral bands to the candles to make them look extra special. Like many couples, this bride and groom chose to have an Imperial table where they sat with their wedding party. In order to further distinguish Cara and Jason as the guests of honor, we made an exclusive table runner with a coral print pattern just for the bride and groom’s place settings. The custom print of this runner was a darling detail made from a fabric we had just purchased in Paris. 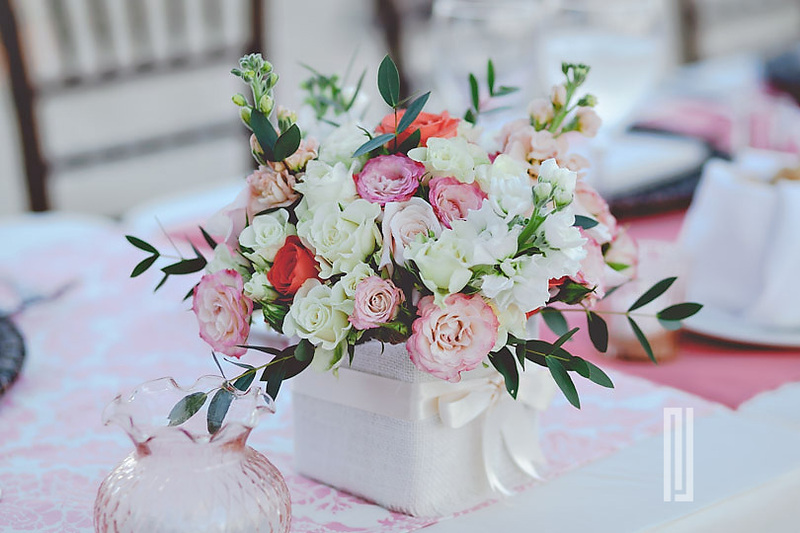 Although we had the pleasure of meeting this bride beforehand and discussing her ideas in person, we send every bride who decides to use our services a vision of what to expect, complete with photos, pricing options and examples of similar set-ups we have done at their chosen venue. There are truly no limits when you design your event with us, which brings a whole new dimension to the planning process. Please feel free to contact us any time with your questions and ideas. 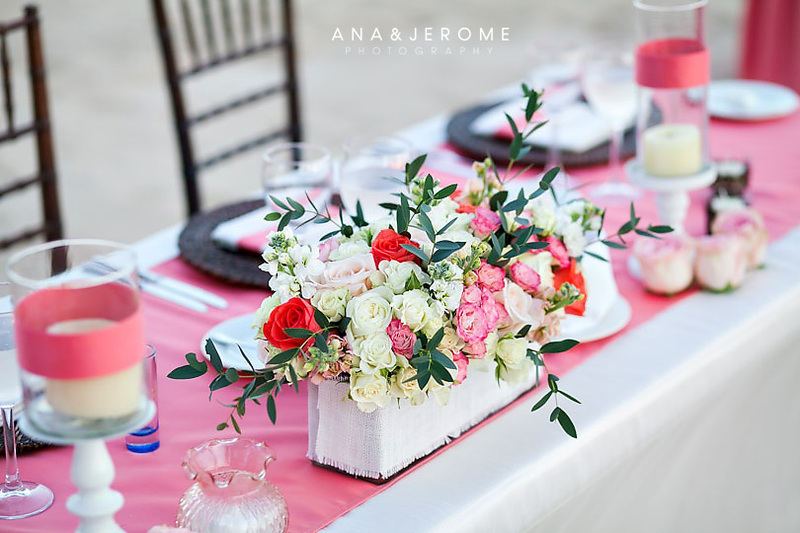 And thank you Cara and Jason for making coral one of our new favorites for beach weddings! This entry was posted in Cabo event design and decor, High end set-ups, Linen collection 2012, Wedding flowers Cabo, wedding locations in Los Cabos, Weddings and corporate events decor and tagged Barcelo Los Cabos, CABO FLORAL STUDIO, CABO LINENS, cabo wedding, destination wedding Cabo, Event decor, Los Cabos celebrations, Wedding design, wedding flowers.